Go to Node.js Downloads and follow the installation instructions. Be patient! It may take a while. You will be prompted for a developer login and a developer password in order to communicate with the platform. The developer login and the developer password will be stored in the .zetarc file. By default, the .gitignore file is configured to not deploy this file. See ZetaPush account management to learn how to manage your account and your applications. Contains the developer’s credentials. Useful to deploy or run your code. The content is auto generated if the file is empty. Standard file used by Git to prevent commiting some files. It is preconfigured to prevent publication of your developer credentials (on GitHub for example). Standard file for NPM to handle a module. It contains the dependencies, the name of your application, the entry point of your custom cloud services (main property) and many useful other informations for your application. Gives you some information about how to use your application. By convention, the front end code of your application is in this folder. You can change it by editing package.json. By convention, the back end code of your application is in this folder. You can change it by editing package.json. Run is used in development phase. You run your code locally on your development machine. You can then iterate on your code to provide new features quickly or even debug your code. This command launches both a local web server on localhost:3000 and the custom cloud services. You can open a web browser on localhost:3000 and open the browser console. You can click on the button and see the result of the custom cloud service call in the browser console. The connection is requested with client.connect() in hello-world/front/index.html. The connection between ZetaPush client and the ZetaPush cloud is established and is bi-directional. Any message sent by ZetaPush client will go through this opened connection. The ZetaPush cloud can also send messages to the ZetaPush client through this opened connection. Then, when the user clicks on the button, a message is sent to the ZetaPush cloud in order to execute some code. 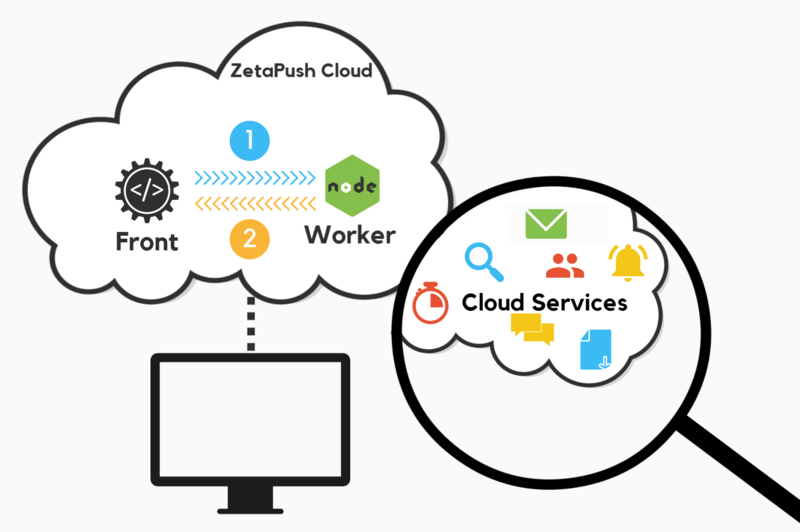 The ZetaPush cloud routes the message to the worker to call the custom cloud function. The action of the button is done in hello-world/front/index.js and it calls api.hello(). The result is handled in hello-world/front/index.js. Even if you run locally, the cloud functions defined by your worker are available on the Internet through ZetaPush cloud. Push is used to make your code "public". It will publish your web page(s) and also upload the code of your worker on ZetaPush cloud. You can push when you think that your code is ready to be used by your end-users. This command uploads your code (front and worker) to the ZetaPush cloud. 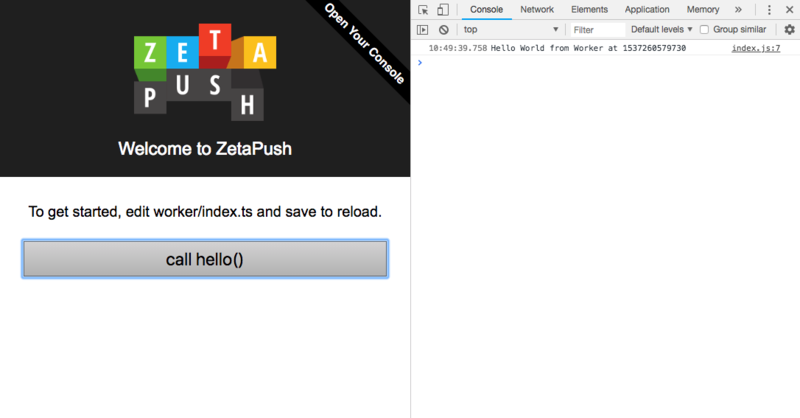 ZetaPush then handles the deployment by publishing your front and your custom cloud services. The CLI displays the URL to access the published web page. You have created a new application, executed it locally and then published it.